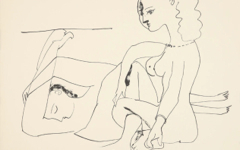 Historians generally do not explain why Picasso turned his green-eyed, red-haired Russian wife, Olga, into a dark-eyed, dark-haired Spaniard.1 The reason why is now, no doubt, obvious to regular users of the site: she had become the feminine self of a dark-eyed, dark-haired Spanish artist called Picasso. Despite some obvious differences the Picasso Museum considers the portrait (right) "a good likeness" judging by the photograph (center). However, she looks equally like Ingres' Mme. Devaucey (left) whom she was probably made to resemble. She too holds a fan and sits on an elegant chair. In another illusion Olga's figure is drawn in the round with a rough shadow falling on the canvas behind her.The chair, though, appears flat like "a painting" with no shadow. 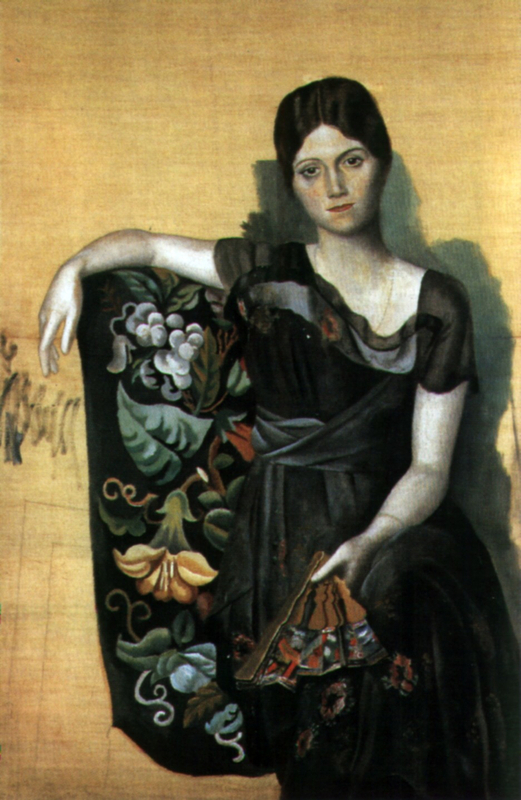 Olga is both model and artist, Picasso's feminine side holding a palette-like fan. Her other brush-hand with a prominent index finger recalls Adam's on the Sistine ceiling and hangs near some paint-marks on "the canvas". Like Mme Devaucey, Olga is fused with the artist's persona and thus "paints" and "creates" her own portrait. 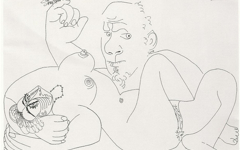 Tip: Remember that great artists rarely make significant changes from nature without meaning. If you can find a reason for the change, as in the chair's lack of a shadow here, you more than likely will understand the meaning too. Don't accept your first understanding of a line. Think again; because artists do before drawing it. Original Publication Date on EPPH: 08 May 2011. © Simon Abrahams. Articles on this site are the copyright of Simon Abrahams. To use copyrighted material in print or other media for purposes beyond 'fair use', you must obtain permission from the copyright owner. Websites may link to this page without permission (please do) but may not reproduce the material on their own site without crediting Simon Abrahams and EPPH.